The focus of a good head shot is your face and natural expression. Wearing clothes that fit, complement, and don’t overpower your face or body are part of the prep process. Keep things simple and bring options if time permits. Solids are best while busy graphics and logos can be distracting. I love to see folks in mid-tone colors like blue, green, wine, or purple and often suggest staying away from white. I think colors can bring a really nice pop to your image and complement eye color. There are also a variety of necklines to consider when planning your wardrobe choices (see graphic below). I have a Pinterest page that includes a board for men and a board for women with lots of ideas for wardrobe preparation. For women in particular, full-length sleeves or 3/4 length sleeves work well. If you’re going for a more executive look, staying away from bare arms is suggested. However, if you’re looking to show off your arms or want a more relaxed look, tank tops or short sleeve shirts are great. 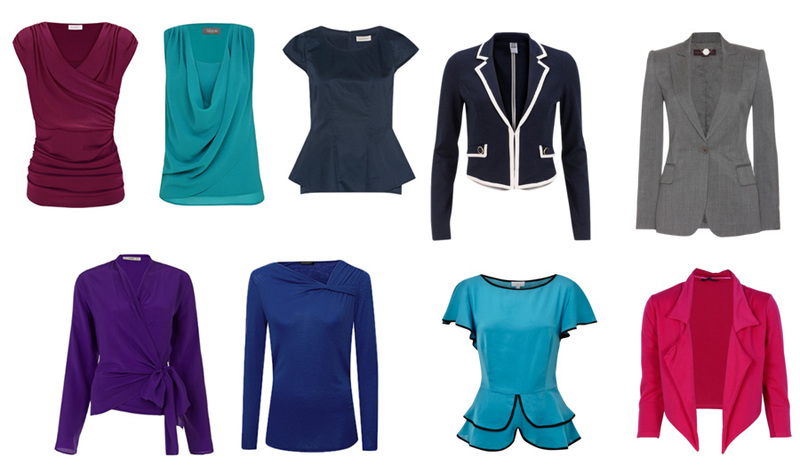 Tailored tops and blouses or dresses are great and can be layered with jackets or scarves. If you wear a jacket consider a collarless top underneath for a sleeker look. Want to go more casual? Sweater sets, casual jackets with light tops, or relaxed button-down blouses are great starters. If you want super casual, jeans and a well-fitted t-shirt can work well. Button-down shirts for men work well and can be paired with suit jackets and a tie. Shirts with a bit of color versus white, or a very subtle pattern, are great. Choose a suit that doesn’t bunch up when you button it or if you sit down, and a shirt and tie that match each other and the suit. Clothing with really tight grids or a small herringbone pattern can have a moiré pattern effect on camera so stay away from tight grid-like patterns. Thin stripes that are a little further apart are okay. Ties look best when the tone lands between the suit and the shirt so a light shirt, dark suit and a tie in a shade somewhere in between is great. Try to stay away from reflective, shiny ties. Want to go more casual? Polo shirts or just a button-down shirt works. Adding a pull-over sweater or vest is another way to vary up your look. Again, keep it simple. The focus is on your face. Large, clunky jewelry can be distracting and date your image. Understated pieces will complement your wardrobe without taking away from the real focus: YOU! Make sure clothes are clean and wrinkle-free. Also, pay attention to the way your clothing fits. Bulky clothing can appear rumpled or make you look larger than you are. I often suggest more tailored, fitted pieces for both men and women. Plan to try on your clothes a week prior to your shoot so you know whether things need to be pressed, cleaned, or you need something else that is a better fit or style for you.